Onion – Onion are popularly known vegetable which is also called as bulb onion or common onions. The leaves of an onion plant are in bluish-green in color. It is also called as Pyaz or Kanda or Dungri in our country. In India, there is no taste in vegetable dishes, non-veg dishes, pulses and chutneys without onions. Onions are irritated the eyes when they are chopped during cooking. Onions are used in making omlates and burgers which are popular among youngsters. Onions are consumed and cultivated in all over the world. It can also consume in raw and are used in making different types of pickles and chutneys. 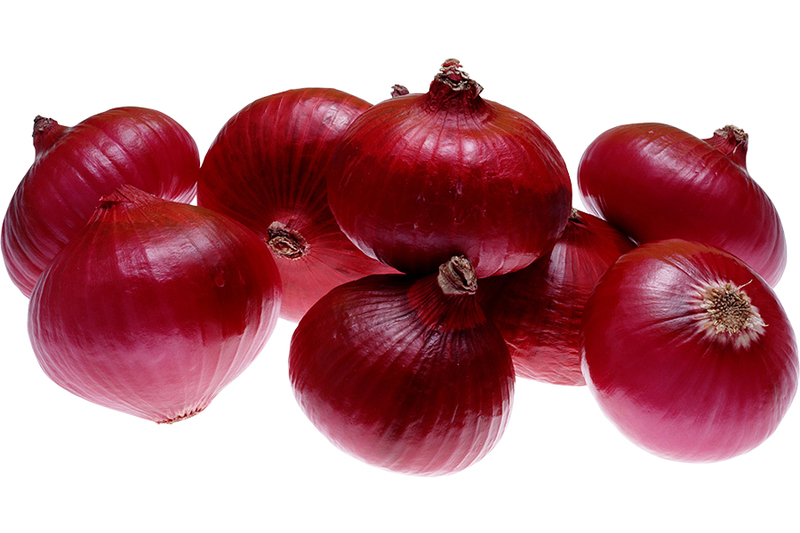 Red onions – This type of onions are purple skin and reddish in color. Generally it is used in making sandwiches, salads, and pickling. At present it is also used in burgers and pizzas. During cooking it loses color. Red onions are crunchy and mild in taste. Yellow onions – It has a white flesh and yellow in color. Mostly yellow onions are commonly used in making chutneys, pasta and curries. This type of onions is chopped then irritating the eyes most. Good for heart – Red onions contain flavonoids which is beneficial for heart. Organosusulfurs are present in onions which are used in the preventing of heart diseases. It also has thiosulfinates is used in thinning the blood and quercetin which lowers the risk of heart attacks and stroke. Onions is used as antioxidant and anti-inflammatory which is beneficial for heart to prevent several heart diseases. Reduce sugar level in blood – As per research, the S-methylcysteine and quercetin are found in onion are used in decreasing sugar level in blood. Thus it is also beneficial for cardiovascular diseases. Lower cholesterol – The flavonoids are present in onion is used in decreasing the LDL which is a bad cholesterol. It also helps in healthy heart. Prevent blood clots – Daily consumption of onions are used in preventing blood clots which causes heart attacks. Blood clotting is one of the main causes of heart attack. It also lowers the blood pressure which causes harmful effects on body especially on heart. Prevent cancer – As per study, quercetin and anthocyanin are found in red onion which are helpful in preventing breast, colon, prostate, endometrial and lung cancers. Daily consumption of onion lowers the risk of several cancers such as gastric cancer, colorectal cancer, laryngeal cancer, ovarian cancer, oral and esophageal cancer. Improve digestion – There is high source of fiber are present in onions which are helpful for improve and healthy digestive system. Reduce blood pressure – Onion contain sulphur which works as a blood thinner and also helps in curing blood platelets. Thus it reduces the blood pressure and lowers the risk of heart attack and stroke. Improved immune system – The polyphenols works as an antioxidants are present in onion which removes free radicals and helpful in making a healthy immune system. Prevent asthma – Onion contains quercetin which are used in relaxed the muscles to assist asthma as per research. Healthy skin – There is a great source of vitamin A, C and E in onion which removes free radicals and maintains skin healthy. It has vitamin C for glowing skin and protects the skin from bacteria. Reduce stress – Onion has prebiotics which are helpful in reducing the stress. Healthy eye – The glutathione are found in onion is beneficial in preventing many diseases related to eye such as cataracts, macular degeneration and glaucoma and maintaining eye healthy. Healthy teeth – Onion contains thiosulfinates and thiosulfonates are a sulfur compounds which helps in removing bacteria and prevent tooth decay. It also has vitamin C which maintains healthy teeth and helpful in relieve tooth pain. Good for hair – The sulfur are present in onion which is beneficial for healthy and thick hair. It also raises the blood circulation in the hair and increased hair growth. Onions are also helpful in preventing dandruff which makes hair strong and healthy.